CARA has been in the news recently regarding results from a survey about American Catholics’ awareness and use of the U.S. Bishops’ Faithful Citizenship document (these CARA Catholic Poll questions were commissioned by Fordham's Center on Religion and Culture). Regrettably, these results indicate that few Catholics were aware of or used Faithful Citizenship in 2008. It’s a shame because it is an extraordinary comprehensive statement of the Church’s teachings and positions on social and political issues. Recently re-released with a new introduction this document will again vie for Catholics’ attention in 2012. Although it is by no means meant to be a voting guide or checklist I do think it provides for an interesting hypothetical test for Catholic voters (...if you have not read it yet, what are you waiting for?). What if Faithful Citizenship was not a document from the U.S. Bishops? What if instead it was a new political party platform? Would you vote for a “third party” that stood for what Faithful Citizenship stands for rather than cast your vote for the Democrats or Republicans? Looking at survey data I don’t think many American Catholics would. Catholics tend to put their party preference ahead of their faith. They often choose to emphasize the issues their party is consistent with Church teachings on and minimize or ignore those that it is not. Why doesn’t the U.S. have a Christian Democrat Party? I think it would be challenging for any party with a religious reference in its name and inspiration to be successful given the culture of separation of church and state in the U.S. It is also the case that a significant Catholic presence in the population required waves of immigration that occurred well after the formation of the U.S. party system. The biggest limiting factor may be our electoral system—the method used to translate votes into seats. We do this the “old school” way of one seat per district going to the majority/plurality vote winner which often leads to the creation of two large parties (with internal sub-divisions coming to coalition before elections). It is winner take all and very, very British. The U.K. currently gets effectively 2.5 parties out of it (Tories, Labour, and Liberal Dems). Losers get little in America. This is not the case in most other democracies (including predominantly Catholic countries like Belgium, Brazil, Costa Rica, Germany, Italy, Poland, Portugal, Spain, and others) where the primary alternative to the first past the post (FPTP) electoral system used in the U.S. and U.K. is proportional representation (PR). In a PR system there are multi-member districts and parties win seats in close proportion to their vote percentages. So if a party wins 20% of the vote they may get about 20% of the seats in the legislature. Such systems typically have at least four and often more political parties. If the United States were to shift to PR elections we would no longer have the Democrats and Republicans of today. More than likely these parties would split up into a social conservative party, a libertarian party, a labor party, and a variety of other single issue, regional, and social group parties. We might have a more visible green party led by Al Gore and the Tea Party movement might become a “real” party (note that America’s founders did not intend to create a system where parties would form and feared the problems caused by factionalism). The electoral system used for U.S. presidential elections also helps reinforce the two-party system. There is of course only one office and it is awarded to the majority/plurality winner of 51 population-weighted state/DC elections (i.e., Electoral College system). For presidential elections in many other countries a two-round system is used. In these, a national vote with many candidates from many different parties is held first—kind of like one big national simultaneous primary. The top two vote getting candidates then go on to campaign more and face a second and final vote perhaps weeks later which then goes to the majority candidate. As with PR, this broadens the field and gives more room for multiple parties to develop and thrive (it also ensures a majority selection, unlike the Electoral College where a candidate winning a plurality or even a minority of popular votes can be elected). In the United States we have room for only two parties in the legislature because losing in single-member districts is so costly. You may win 49.9% of the vote but have nothing to show for it. The costs and challenges for a third or fourth party to seriously enter and compete in American elections are extremely formidable. The electoral systems used in the U.S. make it difficult for a Christian Democrat type of party to emerge—even when one in four voters are Catholic (78% of voters in 2010 were either Catholic or Protestant). Yet this same side then often cringes when we defend workers, speak on behalf of the rights of the undocumented immigrant, and remind government of the moral imperative to protect the poor. … and then these same folks bristle when we defend the rights of parents in education, those of the baby in the womb and grandma on her death bed, insist that America is at her best when people of faith have a respected voice in the public square, defend traditional marriage, and remind government that it has no right to intrude in Church affairs, but does have the obligation to protect the rights of conscience. As Archbishop Dolan describes (and as Faithful Citizenship reads), the U.S. Bishops and the Church are stuck between the two parties. 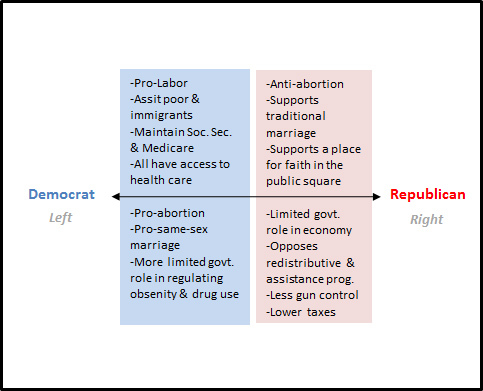 Some of the Church’s stances can be found in the Democrat’s platform and others in the Republican’s platform as shown in the conceptual figure below. But really instead of being “stuck” in the middle, the Faithful Citizenship position (which might be most consistent with a Christian Democrat approach) is more conceptually about 90 degrees from either the Democrats or Republicans. Surely some would argue that the Christian Democrat block would or should distort to the right or the left (e.g., some issues have more “gravity” than others) and in practice in Europe and Latin America, Christian Democrats have been in positions that would most often be considered center-right or center-left. Political theory assumes that if such a movement emerged in the U.S. it would position itself according to the issue preferences in the political system that would maximize its votes while maintaining as much of its core principles as possible. Regardless, it is clearly not easy to be a Catholic Republican or a Catholic Democrat. 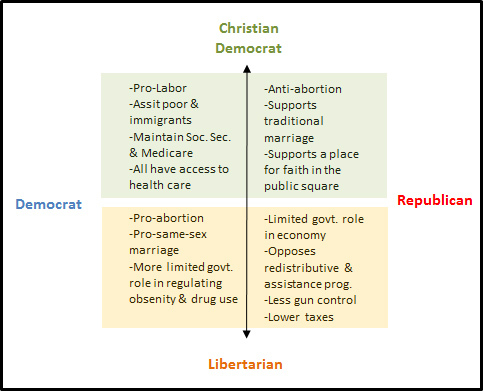 Perhaps it is even more difficult to be Catholic and Libertarian which seems nearly 180 degrees away. The platform of the Libertarian Party has little if anything in common with a document like Faithful Citizenship (although it does share some positions in common with the Democrats and with the Republicans). Yet Libertarians have more of a history as a noticeable third party in the United States. 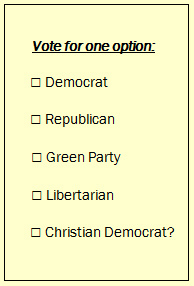 According to an August 2011 survey from the Public Religion Research Institute, 16% of U.S. adults say they think of themselves as a Libertarian and in an October 2010 NBC News/Wall Street Journal Poll, 5% of registered voters said they would consider voting for a Libertarian candidate for Congress. Greens have their own little corner in the American party system but are arguably more single-issue focused and less likely to ever draw broad appeal. Oddly, a Christian Democrat Party has no institutional place but there certainly seems to be a potential spot for it to bloom. Perhaps it could be the .5 of an American 2.5 parties similar to what is generated in the U.K. If anything the prospect of such a party provides a useful measure of how important partisanship is relative to one’s Catholic faith. Note, I am in no way implying that the U.S. Bishops or clergy should or would have any involvement in the development and life of such a party (tax laws limit such activities) and I am certainly not making any case for theocracy. However, as in other democracies, a party created and led by lay people could emerge and compete for votes inspired by the teachings of the Church and its relevant positions on issues important to the country. I am also aware the Christian Democrat parties in Europe and Latin America have had their corruption and scandals. No party is perfect and of course both the Democrats and Republicans have had their fair share of similar problems. Finally, note (as mentioned elsewhere) I am a man without a party or a vote by choice. As a political scientist (and prior to that as a news reporter) I have chosen to be entirely detached from the political system and aspire to be as objective as I can. I am not registered to vote, I don't have tea parties or occupy things, and I do not affiliate as a Democrat, Republican, Libertarian, Green, Communist, Socialist, Anarchist, Fascist, Monarchist, etc. Nor am I a Christian Democrat (i.e., it's just not possible... yet! ).